Cover Title: "Mayhem On The Moon!" Story Title: "Novas In Collision!" Nick Fury is busy interrogating Nova at SHIELD headquarters. After three hours, Nova is getting angry that Fury doesn't believe his innocence concerning the destruction of a US surveillance satellite. Fury uses a paralysis beam to contain the Human Rocket and begins to question him again. 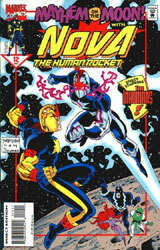 Nova tells Fury that he will cooperate even though he could break free of SHIELD's device. Fury turns off the beam and tells Nova to follow him. SHIELD's leader explained the interrogation was only a formality to make sure Nova wasn't being controlled by outside influences. The young hero thanks Fury for his trust and destroys the paralysis beam with an optic blast! Fury explains that Nova has been cleared by SHIELD but the military leaders of the US Pentagon are still angry about the satellite's destruction. The Human Rocket will be cleared by the Pentagon if Nova completes a mission for them. Fury takes his ally to a room where a replica of the destroyed satellite is waiting. Nova agrees to put the duplicate into orbit where the previous satellite had been. After placing the satellite in orbit, Nova and Fury say their goodbyes and the young hero decides to fly around and enjoy the view. While in space, Nova decides to practice using his powers the way Nova 0:0 had shown him. He tests his uniform's sensory capabilities and finds that he can sense the space around him. Suddenly, the Human Rocket senses a large meteor headed straight for him! Using a full optic blast, Nova destroys the meteor but is hit from behind by an unseen force! Nova turns to discover Nova 0:0 standing behind him! Nova 0:0 was responsible for the meteor and the force blast which struck his ally. The Nova from an alternate dimension has returned to continue training Rich Rider for his upcoming battle with the Deathstorm. The two Novas exchange gravimetric pulses and Nova is left floating unconscious over the moon! Meanwhile at the New Warriors' Crash Pad, Night Thrasher and Namorita are trying to find out more about Rich's status with SHIELD. So far, they've been unsuccessful and decide to gather the rest of the team to break Nova free. At the same time, Night Thrasher continues to research the group known as Shatterforce. Over in New Haven, Connecticut, Laura Dunham is having coffee with a fellow student named Chas. Laura and Chas discuss Nova and his business, Nova Express. The discussion leaves Laura confused about her relationship with Rich and their future. Back in orbit around the moon, Nova had been playing possum with his opponent and hurtles Nova 0:0 full force into the moon! The battle becomes heated with Rich actually surprising Nova 0:0 with his use of the Nova force. Their furious combat is abruptly halted by the group known as the Inhumans! The Inhumans have been witnessing the Novas' battle and see it as a threat to their city of Attilan. As Nova battles Medusa and Karnak, Nova 0:0 quickly knocks out Star-Thief with a gravimetric pulse! Before Nova 0:0 can turn around, he is knocked down by the leader of the Inhumans', Black Bolt! As the battle becomes more intense, Nova 0:0 realizes that the Inhumans have been manipulated by an unknown source. As he tries to find out who is behind the attack, Nova 0:0 has been tricked into colliding with Nova. The Nova of an alternate universe is able to stop himself in time but Black Bolt hurtles an electron blast at the two Novas. Having had enough of the Inhumans, Rich unleashes a full-power gravimetric pulse towards them! However, Black Bolt has tricked the Novas! The electron blast gave the Novas a positive charge with the ability to drain them when Rich used his gravimetric pulse. Realizing what was happening, Nova 0:0 is able to escape but Nova falls unconscious!